The 2015 growing season is, well, pretty much here! But before that explosion!, I am blogging about an awesome project that I helped with in 2014. 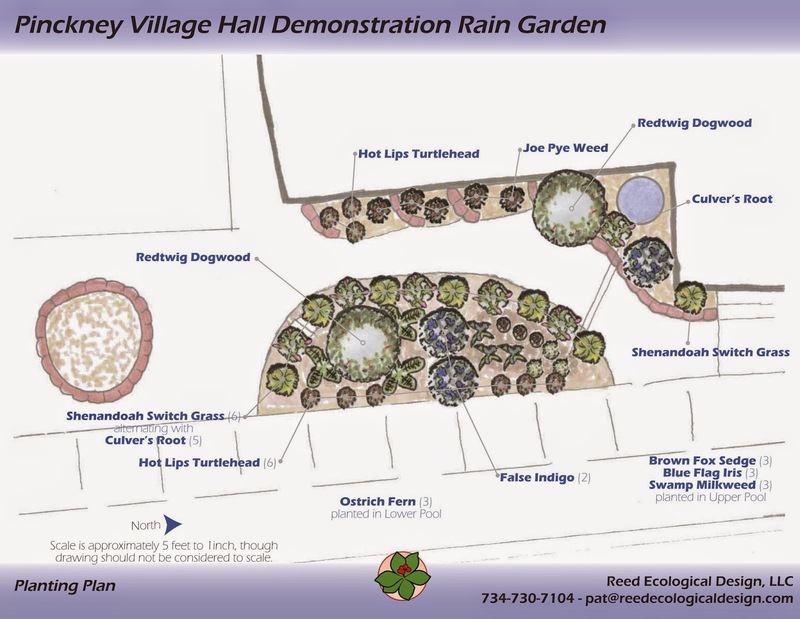 I provided a design for the rain garden in front of the Pinckney Town Hall. 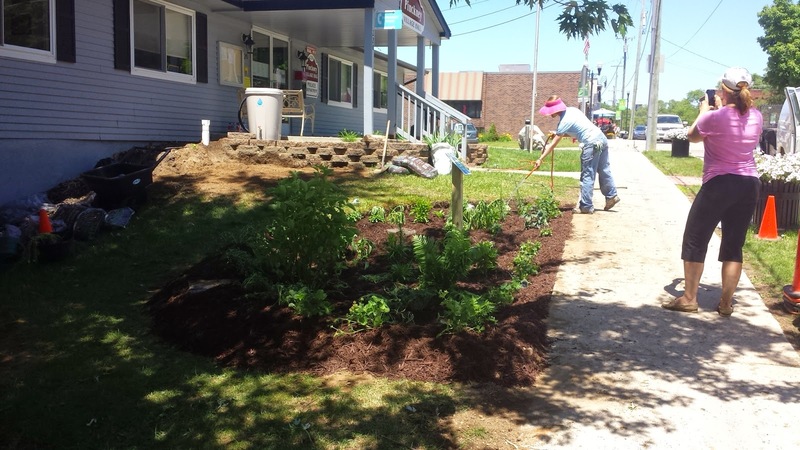 The Pinckney Garden Club provided the hands on labor to install it, and will help maintain it on an ongoing basis. This project came up through my connection with Susan Bryan, the Rain Garden Coordinator in the Washtenaw County Resources office. She knew that Ann Jarema, the president of the Pinckney Garden Club, was thinking about the project. The location, in front of the Town Hall is obviously quite public, so we quickly recognized it as a demonstration garden and foresaw some possibilities for positive social influence. 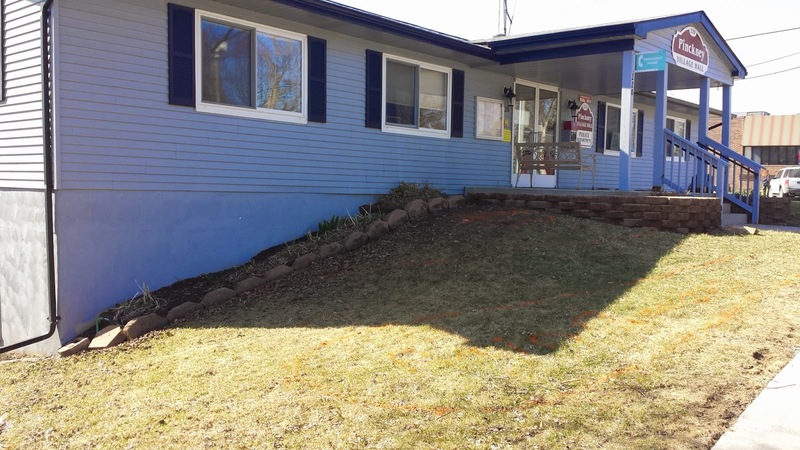 Susan, Ann, and I met on a bright sunny mid April Friday afternoon for a site visit and discussed various layout options and, in the end, made some decisions. Above is a picture of the site that day. I went home and drew up a draft. I provided a chance for feedback input, but Ann and Susan were mostly happy with the draft documentation. Here is the finalized "infrastructure" plan view. I also provided a planting plan. As plants were coming from miscellaneous donated sources, and which particular plants and their quantities would be available on the volunteer day was unknown, I should have titled this a suggested planting plan. For those interested, the whole design documents are linked here. We set an installation day of June 21st. Village folks removed sod from the garden area beforehand, which saved the volunteers quite a bit of labor. June 21st turned out to be a wonderfully sunny day! Photographic opportunities were plentiful, unfortunately, per usual, I was occupied. I did snap a few process photos though, which are almost all included below. Here, we are carefully removing sod unto a tarp to install the underground pipe carrying overflow from the rain barrel to the top of the rain garden. Donated plants came from 3 Dog Nursery and from multiple gardeners of the Pinckney Garden Club. Here is a photo where most of the main rain garden plants are in the ground. In the following photo, you can see the rain garden is installed with a sign, the piping, the overflow pavers, the rain barrel base, and the rain barrel in place, and retaining wall is partially finished. Shortly after the installation day, the building's gutter was altered to divert flow to the rain barrel and overflowing to rain garden. The Pinckney Garden Club finished installing the retaining walls and gardens along the building. It was a great day. The local newspaper even did a nice write up. 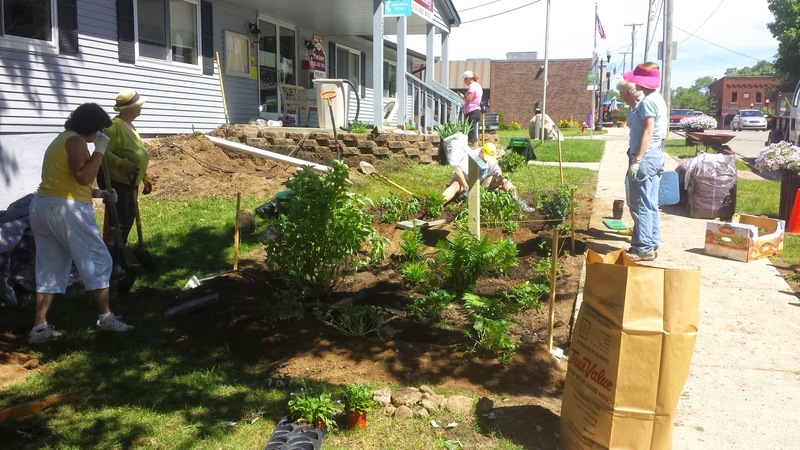 Ann Jarema, the Pinckney Garden Club, and some Village folks continued working on the gardens to finish up the retaining walls and beds along the building, and complete hooking up the gutters. I plan to snap a "year later" photo soonish. 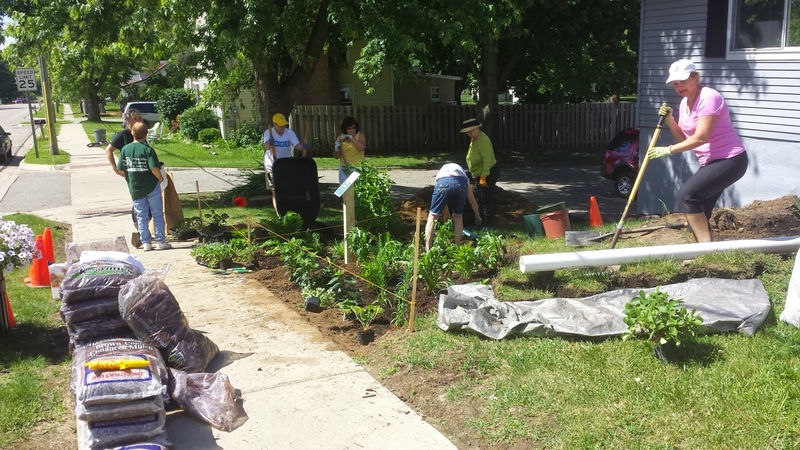 This was the first rain garden I helped install after taking the, highly recommended, Washtenaw County Master Rain Garden program taught by Susan Bryan, and Shannan Gibb-Randall of Insite Design. 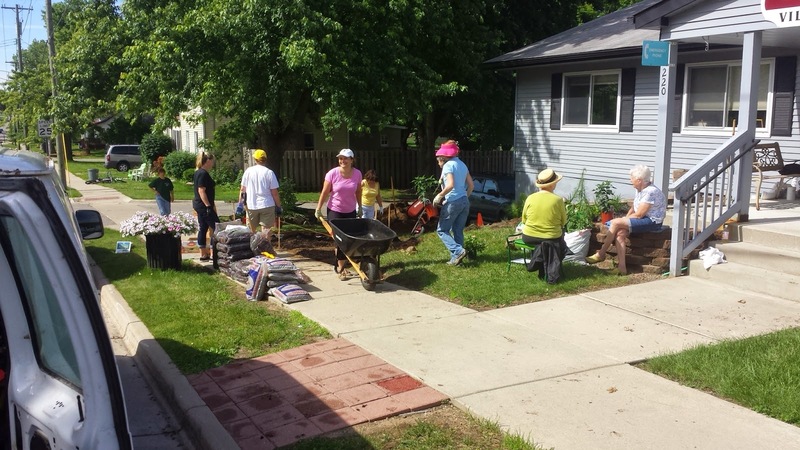 More information about that program and the rain garden effort in Washtenaw County can be found here. This project experience fulfilled a requirement for me to be certified as a Master Rain Gardener. I am looking forward to building at least two (but hopefully more) rain gardens this coming season! Thank you for reading!